This chapter continues where Chapter Two concluded and includes the period 1971- 1980. It continues the story of The Main Event, showing how the impediment was eventually overcome and virtual parity between TVW7 and STW9 was finally achieved. Once again the chapter correlates the relationship between Local ‘Live’ Production, Station Finances and Audience Survey Ratings. 1971 to 1980 were arguably the best years for local production, both in the studio and in the field. TVW7 and STW9 were both enjoying good financial returns and this was reflected in the amount of money available for local ‘live’ production. Ratings started to even out, so now, not only did Community Responsibility foster this area, but a spirit of true rivalry arose, with both commercials stations wanting to be ‘seen’ as the best. It should be remembered that while the reports and comments in the Ratings Surveys areas apply to the calendar year, those on local ‘live’ production taken from Annual Reports apply to the fiscal year. This places some of them in the six months previous to those examined from the ratings. During this period 1971-1980 both commercial stations would expand into business areas other than television and TVW7 would acquire the South Australian station SAS10. A major innovation was the introduction by Federal Government regulation of a new Australian Content ‘Points’ System. Although designed to protect a substantial percentage of Australian content (dubbed ‘local’) in effect the regulations eventually worked to the detriment of the smaller populated States by bringing about cessation of regional local ‘live’ programming. Another major change to be examined in 1979 was in the area Children’s Television Regulation. The most important single change to Australian television was to take place during the middle period of these years with the introduction of the colour system throughout the Commonwealth. The Federal Government had previously promised a lengthy run-up time to the changeover and eventually the announcement was made in 1972 of a commencement date approximately three years later. It will be found that during the time-span covered by this chapter, both of the commercial television stations diversified into other business areas with generally beneficial results for the shareholders. Comparisons continue to be provided between monetary returns from television company investments and other forms of fiscal involvement. Adelaide’s Channel Nine. SAS10 was owned by the Adelaide ‘Establishment’ referred to as ‘The Top Ten’ and although the station was said to be the most modern in Australia, it was at the bottom of the ratings share. The SAS10 Board headed by Moxham Simpson (Simpson washing machines) and a solicitor named Arnold Moulden were only to happy to recommend that control of the station pass to the Western Australian company. The takeover was completed after TVW had received acceptances for 96% of the SAS shares and compulsorily acquired the balance of the issued capital. The offer was one share in TVW Limited plus $5.60 in cash for every 15 shares in SAS. As a result, 199,289 ordinary $1 shares were issued to former SAS shareholders at a premium of $3.90, thereby increasing the issued and paid-up capital of the company to $1,549,257. This created a share premium account of $777,227. The cash consideration for an acquisition of the SAS shares, which amounted to $1,123,484, was financed from the proceeds of the sale of investments and by a fixed term loan from a merchant bank. The whole procedure only took between two and three months. During the year the basis of accounting for television programmes for SAS10 was changed to bring it into line with the method used by the parent company. This increased the cost of television programmes written off during the year by $142,191.This abnormal item of expenditure had a material effect on the trading results of the subsidiary company, which otherwise would have achieved a profit of $111,822 for the full year. This figure compared with a profit of $66,284 for the previous year. It was reported that the executive staff were to benefit from share grants. During the year ended June 1971 options in respect of 46,500 shares of TVW Limited were granted to James Winter Cruthers, managing director of TVW Limited (7,000 options) Brian Sydney Treasure, general manager (7,000) and senior staff members – Frank Archer Cecil Moss (7,000) Leslie Darcy Farrell (3,000) Maxwell Arthur Bostock (3,000) John Richard Quicke (3,000) William Hugh McKenzie (3,000) Gregory Vincent Byrne (3,000) Alfred Wesley Binks (3,000) Stanley Frederick Fildes (3,000) Geoffrey Raymond Mortlock (1,500) Ernest Gerald Taylor (1,000) Kenneth Newland Kemp (1,000) and Bernard John Roddy (1,000).These options expired on December 4, 1975 and could be exercised at a price of four dollars ten cents per share at any time between December 4, 1972 and December 3, 1975. There was an over-rider which stated that if the recipients left the employ of TVW7 the offers would lapse, excluding death, or retirement due to age or ill-health. The decision to reward the participants was made by an appreciative Board and further cemented the loyalty and endeavours of those who benefited. Although not yet in the league of their older relation ‘up the hill’, STW9 returned a profit of $320,671 after providing for depreciation of $211,067 and taxation of just $500. The advertising revenue increased on a monthly basis and costs were kept under control. In order to make sure that the Company was in a position to vigorously service viewers, the opportunity was taken to purchase extra studio equipment at most advantageous prices…Micro-wave links, Videotape machines, news cameras, studio cameras and control equipment. During the year the Company’s large outside broadcasting van came into operation. It has been given extensive use. It is a most versatile piece of equipment and has substantially assisted your Company in giving a full television service to the metropolitan area. The first survey of 1971 brought a little joy for STW9 with two programs at No.14 and No.15. STW9 had introduced a children’s talent search program called Junior Spotlight which, at 9 a.m. on Saturday rated a disappointing 4,4 against TVW7’s Football Replay at 3,2. STW9’s Woman’s World at 3.15 p.m. on Friday rated 5,4,4, against the recorded Sydney program on TVW7 Beauty and The Beast 9,9,8. At TVW7 Perth’s New Faces was now returning 20,20. STW9 News was doing better at 22,22 to challenge ABW2 on 24,24 but still trailing TVW7 at 31,31. The survey conducted in July-August 1971 showed TVW7 to have the Top Ten including Letterbox a new ‘live’ local production which was aired on Sunday evenings. It was a quiz show which rated 36 with 169,000 viewers. Stars of the Future was No.10 with 34 and 152,000 viewers. 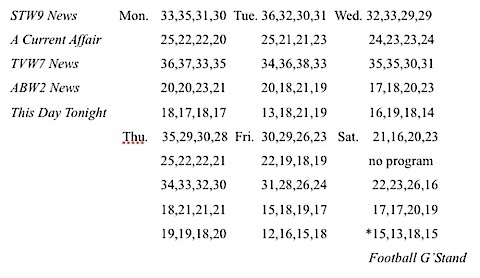 It’s Academic was still successful over four weeks with 34,31,38,32. These results were further consolidation of the proposition that viewers still saw TVW7 as their ‘local’ station and accepted their offerings of local production. The three News sessions (TVW7 had by then joined STW9 for a 6 p.m., transmission.) were showing a quite distinct degree of levelling. These are very important comparisons as News is considered by all television stations to be ‘the flagship’ and the main measuring device for advertisers. Telethon, the epitome of local ‘live’ production was programmed to occur in a ratings period and returned the highest survey figures of 42 at 9.45 p.m. on Friday 23 October 1971. On Saturday the average was 30. Another local production on TVW7 was Miss Western Australia which rated 38. The next survey showed that Please Sir! and On the Buses were now No.s 2 and 3 with 41% each and 190,000 and 185,000 viewers respectively. The Stations operating profit exceeded the previous year by $210,219 and a dividend was paid amounting to 24% for the term. TVW7’s outside ventures now contributed about 30% of this profit. TVW7 shares were now $5.20 and consequently returning about 5% to purchasers at that time. For comparison, National Bank shares were selling at $4.20. Of course, those who held the original $1 par shares were reaping an enormous return on their investment. Perth Building Society was paying 6.5% at call, the Atlas Investment Fund 11% on debentures and Norman L. Payton was still offering 8% at call. The Company’s issued capital was increased from $1,549,257 to $1,948,196 by the issue of 398,939 ordinary $1 shares in a one-for-four premium issue. It was recorded that Mr. R.A. Long, one of the original Directors of the Board died. TVW7 stated that the Station still attracted ‘…more than half the total television viewing audience in Perth.’ This was an admission that STW9 was making inroads. Radio Station 6IX had moved to Tuart Hill and had consolidated its position as Number 1 in Western Australia. SAS10 in Adelaide returned a small profit for the year. The Company purchased a controlling interest in Group Color (WA) Pty. Ltd., a local colour processing laboratory. Disney on Parade throughout Australasia was a great success with over one million attending. The Nickel Queen did well locally but ‘died’ in the Eastern States. Investment was made in Fauna Productions for the production of a 13 part colour series called Boney which was based on the popular novels of Neville Shute. The financial situation of STW9 continued to improve with a net profit of $269,402 and a dividend of 12.5% was paid to shareholders. The Board acknowledged the introduction of colour in 1975 and stated, ‘Colour will bring a new dimension to television entertainment. During this year the Swan Television Board decided to follow a popular trend by changing their share structure to the effect of creating two 50cent shares for each par value one dollar share. Cruthers thought that one reason for this move was to make a share purchase more attractive to small investors, by increasing the actual number of shares to be held by simply halving their value. Of course, those with the one dollar share holdings immediately had their holding doubled so the returns were the same. The process also had the effect of halving future dividends percentages as will be seen in the following years. Swan Television shares were quoted at $1.18 on the reported Stock Exchange figures. Ratings – 1972 showed that on a Sunday both ABW2 and TVW7 were telecasting the Sheffield Shield Cricket for 15 and 8 respectively against the STW9’s 8 to 14 but on Tuesday the figures dropped to 12 against TVW7’s 9 and STW9’s 12,14,19,21. This improvement to the latter’s figures was no doubt caused by children deciding what to watch and led to the cessation by TVW7 of their participation. However, the following Saturday ABW2 was 15, TVW7 10 and STW9’s Junior Spotlight 7,4,3. The program which followed on TVW7, It’s Academic, suffered a fall to 25 against the ABW2 News. This Day Tonight was still performing strongly on ABW2 with 22,25,17,24. Six months later It’s Academic with 26,32,32,32 was back at No.9 with viewer numbers of 141,000.
the very good figures (based on each half-hour period) of 14,15,15,15,16,15,15,15,15,14,16,16. On a Sunday night the STW9 News at 6 p.m. outscored Reach For The Stars 19,25,24,25 to 7,20,21,19. TVW7 had a new live local production with Anything Goes, a variety show hosted by John Fryer and Peter Dean. It went to air at 9.30 p.m. on Saturday nights with a small orchestra conducted by Terry Ingram, interviews, plus visiting and local guest artists. The ratings were only fair with 18,15,11 against imported movies on STW9 with 18,16,18 and The Forsythe Saga repeated on ABW2 with 8,4,7. Peter Dean said that the biggest problem with the show was continuity, as the transmission was interrupted by ‘crossing live’ to Gloucester Park for each trotting race. However, as will be later reported, a ‘special’ with Barry Crocker on STW9 did not draw away the TVW7 audience. structures so that basic par values for both Companies was now 50cents per share. This meant that TVW7 shares in real terms were maintaining their value. Rates of interest being offered in other investments were, Intercontinental Development Corporation Pty. Ltd. 16% warranted; Mutual Acceptance 9.5% for 3 years, Mercantile Credits 9% for 3 years with 7.5% at call; R & I Bank 6% at call; Home Building Society 7.5% at call, 8% for 6 months; Aust. G’tee Corp. 9% for 4 years and Cambridge Credit 9.255% for 5 years. General inflation associated with the change of Government after 24 years brought the comments that although revenue had increased 17%, the profit was only marginally better than the previous year. This could be sheeted home to rising wages and the cost of programs. The Company no longer claimed a major percentage in the ratings surveys but said that they were ‘…being well operated by a keen and efficient staff.’ 6IX continued to perform well and contribute to profits. SAS10 in Adelaide had increased its viewing audience and thereby picked up on advertising revenue. TVW7 acquired total ownership of Group Color (W.A.) Pty. Ltd., a company involved in producing large bill-board posters etc. TVW7 had also invested in the City Theatre group. It was estimated that the changeover to colour would cost both Stations (Perth and Adelaide) $2.3 million each. Woman’s World, Wonder World, Cooking with Gas, Cartoon Club, Wanneroo Car Racing, Junior Spotlight, Spotlight, What’s The Score, Topline Basketball and the specials Time Capsule at Three Fathoms, Bazza McKenzie in Perth, Quest of Quests, Miss Crowning Glory and the Beautiful Baby Show. Winter Surf Lifesaving Championships, W.A. vs S.A. Basketball, Ampol Night Soccer, Offshore Powerboat Championships, State Surf Lifesaving Championships, Golden Gloves Awards, Australian Squash Championships, Rugby- France vs W.A. and 20th Annual Water Ski Championships. Final photographs were ‘Ray Shaw operating our latest colour video tape machine’, “Kevin Cantelo (Chief Engineer) and Graham Cherry (Programme Manager) of 6KY’, ‘News and Weather Team’, ‘Peter Barlowe and assistants during vintage car drive for funds to aid Slow Learning Children’s Group.’, and Lloyd Lawson and Jenny Clemesha admiring latest colour control desk’. This held pointers to a future time when matters of technical interest would be considered more important than station ‘personalities’. 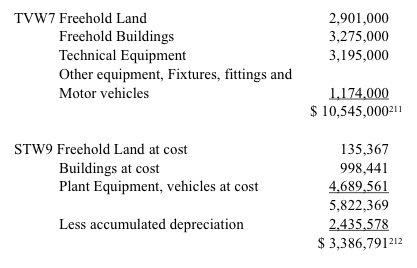 Operating profit was $622,500 (last year $510,369) after providing $252,455 depreciation ($233,975). Taxation absorbed $272,622 ($241,067) leaving $349,878 ($269,402) available. A small capital profit of $7,896 was not included. A dividend of 12.5% was paid for the year. Swan Television shares were selling for $1.35, so their return was twice as good as those of TVW Limited. STW9 purchased radio stations 6KY and 6NA for the sum of $1,101,018 during the year and although they incurred a trading loss, future benefits were expected to accrue. The move into the associated medium was prompted by TVW7’s acquisition of the 6IX group. STW9 was also part of the consortium which took over City Theatres Group. The company operated the Skyline, Starline, Riverline, Beechline, Daleline, and Parkline drive-in theatres plus the Piccadilly, Grand and Royal city theatres. Once again this can be seen as copy-cat behaviour by STW9 and a wish to ‘match-it’ with their competition. It was estimated that 224,000 families in Perth viewed television, up from 168,000 in 1970. There were approximately 3,450,000 homes in Australia with TV sets and 11.1 million radio receivers, equal to one set for every Australian over the age of six. 75% of new cars were equipped with radios. And portable TV sets were beginning to make their appearance. It was recorded that STW9 repaid a large loan from the A.M.P. Society which stood in the books as $547,844. This was an indication of the new liquidity gained by the Company. It was during this period that the Federal Government introduced a new ‘Points System’ which was intended to boost Australian production. Types of programs were rated as scoring certain points depending upon classification and viewing times. The initial formula required the stations to score one point for each hour on air. In practice this worked to the detriment of Western Australian local ‘live’ production as it became cheaper to purchase an Eastern States syndicated program which fulfilled the provisions of the Act. This development in Government regulation would have been better if it had called for a certain amount of ‘local’ production in each State of the Commonwealth. In the 1970s, the bodies set up to regulate commercial television have increasingly been the targets of criticism. The critics hold that the stations have not been adequately supervised by these reluctant regulators. At the same time, the TV stations suggest that the Australian Broadcasting Control Board, and its successor, the Australian Broadcasting Tribunal, have tended to intrude too much into the conduct of the stations and have threatened the full and adequate development of the system. Cunningham and Jacka reconciled the intrusion of Government policy with the impending pressures of sustained economic rationalism. Indigenous means drama written, performed and produced by Australians. Social, Economic examination of newsworthy items. The 1973 Ratings saw a ‘new kid on the block’ in a program produced in Sydney by Peter Bernados (former Producer of the unsuccessful Tonight Shows at STW9 in 1969/70) for ATN7. It was the all conquering Number 96 which showed survey figures at No.1 of 42% with 191,000 viewers. The rest of the Top Ten were still with TVW7. As a new attempt at a local ‘live’ women’s program on Tuesday early afternoons STW9 introduced Cooking With Josephine Farley a new program for women sponsored by a gas company. It languished with 5,6,5,5, against Days Of Our Lives on TVW7 with 16,18,23,20. On Thursdays STW9 tried an Entertainment Guide but it also failed at 5,5,5,5, against the same opposition with 15,14,20,20. Anything Goes was still going to air with 14,13,12,12 against the STW9 movies 19,10,11,8. The second ratings survey of that year showed a big increase in the number of viewers, probably accountable by the change in seasons. All ten programs were on TVW7. New programs on STW9 included the Melbourne produced children’s show Young Talent Time with Western Australian export Johnny Young as Producer and Compere. It rated poorly 14,17,11,12 against the TVW7 News with 40,42,42,39. B.P. Showcase returned to STW9 on Monday nights and TVW7 mounted big specials against that show with the winning results of 40,39,42,41 to 21,24,23,19. The viewer’s tastes had changed since the initial success of Showcase. STW9 put on a locally produced program called Bazza McKenzie in Perth which rated 15,15 against Anything Goes with 21,19. The reason for this is a little difficult to fathom as Barry Crocker was well known in Perth through the movie The Adventures of Bazza McKenzie, appearances at local cabarets and Telethon. However, the viewers stuck with TVW7 and this was probably due to the fact that Anything Goes was a regular program as opposed to Bazza McKenzie being a ‘one-off’ special. It can also be surmised that the viewers of the TVW7 program did indeed follow the trotting telecasts. The last survey of 1973 still showed TVW7 with the Top Ten including a locally produced ‘live’ special Miss Western Australia shown on a Wednesday night which scored 36% with 183,000 viewers. On Sunday evening Telethon scored 34 against STW9 News with 11 and ABW2 News on the same figure. At 7.30 the Telethon figure had swollen to 53! TVW7 instituted a new current affairs program late at night, 10.30 p.m., which rated 6,8,8,9 against STW9 movies of 5,6,8 and the end of a Royal Variety Concert which rated 25. At 8 p.m. on Thursday the ABW2 ‘cult-followed’ show Aunty Jack did not have much appeal with 8, against TVW7’s On The Buses with 42 and STW9’s The Persuaders with 22. The fact that all of the programs on commercial television came from a common ‘pool’ does nothing to supply the answer as to why, generally speaking, at this time they rated better on TVW7. In 1966, to obviate an auction system whereby the Distributors could exact the best price for their wares, the two commercial stations had formed a buying cartel. This meant that they negotiated the best price for programs then chose which they would have by ballot, with a simple coin-toss deciding first choice. However, the system had always favoured TVW7, as when it was instigated, James Cruthers insisted that his station should retain the rights to their already well established programs such as Disneyland, Gunsmoke, and 77 Sunset Strip etc. There was also the phenomenon that local productions always seemed to rate better on TVW7 than STW9. As mentioned on p.145, Jeff Newman claims that it was a matter of ‘better production people’ but even that seems to be a simplification. On many occasion I was approached by members of the public who would say ‘We see you sometimes on the telly, but we wish you were on our channel!’ This ‘built-in’ advantage persisted for at least six years. The cover of Sixteenth Directors’ Report TVW7 1974 had eleven small photographs of Humphrey B. Bear, Fat Cat and Percy Penguin trying for a Hole-in-One; Rolf Harris viewing a model of the proposed Entertainment Centre; The Christmas Pageant; Dorrie Evans from Number 96 with Peter Dean and John Fryer, Stuart Wagstaff and friend, the Prime Minister Gough Whitlam, Barry Crocker; Sandy Palmer; the racing yacht ‘Southern Cross and Lionel Yorke and guest on Telethon. Page 4 was a full colour photograph of Jeff Newman with newly crowned Miss Australia, Miss Western Australia Randy Baker. Newman was now TVW7 Production Manager and the direct telecast from Perth Concert Hall was seen around Australia. dividend of 17% to the shareholders. The Stock Market showed that TVW Limited shares had dropped to $1.57 and their return to new investors had consequently risen. By comparison shares in the National Bank had fallen to $1.40. Money was ‘tight’ and other offerings were from General Motors Acceptance Corporation 12% for 180 days; Australian Guarantee Corporation 12% for 2-4 years; W.A. Building Society 10% at call, Norman L. Payton 12% at call. On 4 October 1974 the front-page headline was an announcement from the Federal Treasurer. Mr. Crean said ‘The Credit Squeeze To Be Eased ’to restore business confidence. There was to be no bonus dividend as there had been in the past five years because of the need to conserve funds and the shareholders were asked to remember that those were paid from capital gains. A special item of business was to pass a resolution to grant 20,000 ordinary 50 cent share options to Joint Managing Directors J.W. Cruthers and B.S. Treasure. This was instigated by the Board as recognition for the work done by the two executives in maintaining the position and profitability of TVW7 Limited. They now occupied equality in the Company structure. Expenditure on Australian content increased by 69% in the year. The TVW7 Report said that wage increases amounted to a startling 45% over the past two years and there were no signs of this pattern changing. Over ten years the salaries and wages bill had risen 320%, program costs increased by 144% and overall operating costs had risen 226%. This was a reflection of the enormous blow-out in inflationary pressures brought about by the changes and reforms promoted by the Whitlam Labor Government, which was elected in 1972. Because of liquidity problems and a fear of the future, a proposal to extend the studios at a cost of $500,000 was deferred. 6IX continued to earn money but SAS10 in Adelaide reported less profit. Group Color (W.A.) continued to trade profitably. The big news of the year was that a new venue was to be built in Wellington Street Perth, to be known as the Channel 7- Edgely Entertainment Centre. Two new subsidiaries were registered to build and operate the complex which would include cinemas and a tavern. They were Academy Entertainment Pty. Ltd., and Academy Tavern and Restaurant Pty. Ltd. With a projected opening in December 1974 the first attraction would be The Russian Gymnasts followed by Disney on Parade with an official opening on Boxing Day 1975. The total cost was expected to be about $6.5 million and the Centre had a loss of $45,953 in preliminary costs for the financial year under review. Other involvement with other enterprises not directly related to television included film distribution, management and promotion of stage productions and concerts, and merchandising. Group income rose by 68% in the period. Most of this entrepreneurial activity was due to Brian Treasure, although he was against the take-over of SAS10 in Adelaide and strongly opposed the introduction of Telethon. STW9’s first use of colour photographs was made in the Eleventh Annual Directors’ Report STW9 Limited 1974 but promotion of local ‘live’ or personalities was not in evidence. Management had a fear of ‘creating monsters’ who would want to be in proportion to their Eastern States counterparts. When I was getting $70 a week for being a television ‘star’, Geoff Corke ‘King of the Kids’ in Melbourne was receiving at least five times that figure in Melbourne. The pictorial content was of Station vehicles, Sports Staff and a smiling Gough Whitlam on local production Newsday. Comment was directed at a new Government measure. In August 1973, the Australian Broadcasting Control Board introduced the first stage of the “points system”. Management saw that it was a threat to local production. In June 1974, the second stage commenced and we were disappointed that due recognition was not given to our efforts. It is the policy of the Government to encourage Australian production, and it was with this in mind, that STW9 produced twenty-two episodes of a half hour Australian Drama series called “the Drifter”. At the same time we commenced a Current Affairs programme “Newsday” on a regular basis. These programmes are extremely expensive and if we are to produce them in our small market and generate local employment, the points system must recognise this special effort which is proportionately greater in comparison to our maximum achievable revenue than a similar effort in a larger market. Unfortunately this argument has not been recognised by the Broadcasting Control Board and we have discontinued the drama series. The net profit was $366,160 and a total dividend of 12.5% was made to the shareholders. Swan Television shares were trading at 90 cents. The rising operating costs were echoed by the Board and salaries and wages increased by 30%. There were one hundred and seventy people employed at STW9 and the total wages bill was more than $1.1 million. The number of Outside Telecasts rose against the previous year and a number of colour ‘specials’ were produced and sold overseas. STW9 was on-air for 100 hours per week and Radio 6KY for 168 per week. The Station conducted a successful experimental colour transmission on 6 July 1974. Commonwealth facility are not being made available to our viewers as much as we think it ought to be. Again our argument here is that given our small market, the cost of this service on a per viewer basis is much higher in Perth than in the Eastern States markets, and recognition must be made of this point if viewers in this State are to have the same access to News programmes as is possible in Sydney and Melbourne because of their larger populations. We believe that our argument is in harmony with the Government’s policy of Urban and Regional Development. Two stages of the points scheme have been implemented and a third stage has been foreshadowed by the Australian Broadcasting Control Board. If this places further burdens on your station, they will be most difficult to bear. Television must first absorb the cost burdens of the color era. The ‘broadband’ referred to was the facility operated by the Postmaster General’s Department, which allowed the ‘live’ transmission of programs from the Eastern States to Perth. It was a limited service because there was only one channel of communication and this had to be ‘booked’ by television stations well in advance. Because of cost, it only catered to important events. The first of these was a ‘live’ telecast of the 1973 F.A.Cup Final from England. It was recorded that Foundation Director David Bell O.B.E. had died in November 1973. No 9. The new program at 6.30 p.m. on TVW7, The Brady Bunch was No.13 with 138,000. Their News was back at 6 p.m. and beating that of STW9 27,26,26,20 to 15,13,11,11. In 1992, Muir noted that ‘Most stations and networks promote their programmes through the press in both paid advertising and editorially, through billboards and the radio. The most powerful and common form is, however, on television “promos”.’ Bill Bowen claims that the turn around was eventually accomplished by a magic formula whereby one ‘strong’ rating program was saturated with promotions for other shows. While the contribution of STW9 executive Len Downs was significant, the passage of time had eased the second station into a more acceptable position as far as the audience was concerned. For the first time, in the Seventeenth Directors’ Report TVW7 1975 there was a complete absence of photographic material but the following information evidences the first implications of economic rationalism. Emphasising as it does the necessity for the shareholders to profit, it opens the way for consideration of curtailing expenditure. One of the first areas to eventually fall victim to the ‘eco.rats’ would be local ‘live’ production. The proclaimed socialist policies of the incumbent Labor Government drew the following blatant editorializing, a new trend in the television annual reports. It was argued that the general thrust of the Federal Government ‘…must be resisted and, if not destroyed, at least controlled to the greatest possible degree.’ It was implied that the projected attack on economic difficulties and unemployment would have to start with revitalisation of the private sector. Public perception that ‘profits, investments – and even shareholders’ were unacceptable components of society had to be changed. The writer claimed an ally in the Treasurer Mr. Crean, who had said publicly in 1974 that company profits were contiguous with higher rates of employment and that the higher rates of wages were a threat to both. what might fondly be referred to as “ordinary people”, most of them holding only a few hundred shares. They rely on their dividends. This is particularly so of retired people – and many of our shareholders are retired – who need their dividends to bolster fixed incomes which are diminishing in value almost daily. To consolidate the above complaints the TVW7 Annual Report said that because of the adverse economic climate and the costs of colour conversion, the net profit was down 9% for the year to $1,207,284. However the Directors considered this to be a ‘sound performance’ in spite of their foregoing Prophet of Doom pronouncement. The dividend was set at 11%. TVW Limited shares were at $1.30 down 27c on last year. The National Bank had recovered to $2.40 while the Bank of NSW shares were high at $6.42 and the ANZ Bank was $6.00. Despite the promises from the Whitlam Labor Government, Australia’s financial situation had worsened and credit was still ‘squeezed’. Chrysler Corporation was offering 13.5% interest on money invested for 3 years; Finance Corporation of Australia 12.75% for 5 years and the W.A. Building Society 9% at call. Housing loans from Perth Building Society were being offered at 10.5%, while Town and Country Building Society was charging 11%. TVW7 continued as the cornerstone of the Group’s activities. SAS10 had a disappointing year with interest on loan funds from the parent company for colour equipment being a major reason. 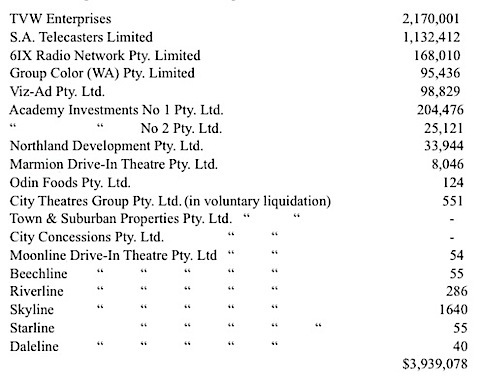 Unused black and white programs to the value of $80,003 were written off, but because the station’s audience ratings improved they received a higher share of Adelaide’s advertising expenditure. In June 1972 TVW7 purchased an investment company with big tax losses and transferred their Radio 6IX interests to it with the view of offsetting profits against accumulated losses. Shortly afterwards the Federal Government changed the taxation laws and submitted a revised tax bill for $140,720. This information made the former bleating regarding loss of profits ring a little hollow. Group Color moved into new premises build adjoining the TVW7 studios at Tuart Hill and only achieved ‘modest profits’. The Entertainment Centre was completed and opened as planned after the contract building price of $3,071,000, fit-out at $1,745,000 and establishment costs of $184,000 ( a total of $5 million) blew out to almost $8 million. Both Federal and State Governments provided loan funds ‘at reasonable rates’ but the added interest costs would off-set profit returns for a long time. The Centre was not alone in suffering costs blow-outs and many other large capital works had met a similar fate during the preceding two years. There was a relatively smooth transition to colour with the estimated cost of $2.5 million for TVW7 proving to be correct. Surveys showed that colour TV sets were selling at a faster proportional rate in Perth than anywhere else with the exception of Sydney. TVW7 followed the lead by STW9 in their last annual report and gave themselves an extended pat on the back for community activities. The Ninth Annual Directors’ Report STW9 Limited 1975. sported photographs promoting both technical areas and non-studio local ‘live’ production. ‘One of the station’s new colour cameras’, ‘Part of new master control centre’, ‘Appealathon telephone room’, ‘Laurie Kiernan (Managing Director) announces final figure at end of Appealathon telecast.’, ‘6KY on air’, ‘Part of huge crowd at Ascot for “Colorfest” marking start of colour outside broadcasting’, ‘White Water classic- The Avon Descent’, ‘Filing of documentary on Bishop Salvado of New Norcia, “Outside the Walls’ and ‘Early stage of this year’s Fun Run’. Station ‘personalities’ were nowhere to be seen! Although the net profit was only up $21,678 on last year to $357,938, the Directors considered the result to be a good one as ‘colourisation’ increased both depreciation and interest charges on borrowings. The dividend for the year was 14% being 7.5 cents for each 50 cent share. Swan Television shares were at 80cents. The cost to change to colour was $2.1 million which would spread over a number of years. The Report made this fairly obvious and non-arguable announcement, ‘ “Once you have seen colour transmission it is pretty hard to go back to the old black and white” seems to be the universal attitude.” ’. In contrast to the start of television in Western Australia when most people purchased their sets on Hire Purchase, large retailers estimated that 95% were paying cash for their colour sets, a fair indication of the improvement in Australian standards of living. The penetration was reckoned to be already 12.5%. The Australian Broadcasting Control Board received a bouquet for choosing the PAL 625 line colour system for Australia. At STW9, Director’s fees which had stood at $7,000 for ten years were increased to $15,000. Through their subsidiary companies D.M. Cullity, W.J. Hughes, W.J. Hughes (Junr. ), L.J. Kiernan, B.F. Prindiville, P.B. Young and G.R. Young had full control of the Company. 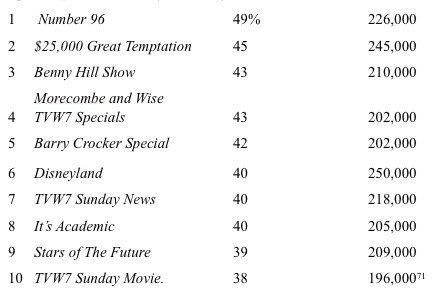 The first audience survey of 1975 showed that six of the Top Twenty programs had been aired by STW9. They were Hogan’s Heroes at No.8 with 125,000 viewers, Thursday News at No.12 with 120,000 viewers. The Streets of San Francisco and The Box (set in an Eastern States television station, one of the stars was Barrie Barkla, who later worked with STW9) at No.14 with 116,000 viewers, Matlock Police (a Crawford Production) at No.15 with 114,000, Saturday Movies at No.17 with 109,000 and Adam 12 at No.19 with 106,000. Despite the fact that with one exception they were all in the lower Ten, the overall picture was surely changing. In the afternoon time slot the perennial Bugs Bunny Show had finally been overtaken by STW9’s Land of the Giants 9,8,9,10 to 9,4,5,5. The older Dobie Gillis on TVW7 8,5,8,8 was being beaten by Gilligan’s Island on STW9 with 12,11,15,12. The second survey provided another upset when STW9 for the first time rated No.1 with the Monday movie Planet of The Apes with 213,000 viewers. One of their Sunday movies was No.2 with 191,000 viewers. There was an important change to the status quo when It’s Academic lost its superiority to an American comedy set in a German Prisoner of War Camp – Stalag 13. It lost 24,21,21,23 to Hogan’s Heroes with 29,29,36,30.126 The third survey for 1975 showed that Cooking with Josephine Farley was still on air but only rating 4,4,3,2. Gilligan’s Island [see 1967 comparison] was being repeated again at 5.30 p.m. out-rating TVW7’s Tarzan, 22,19,17,20 to 16,16,16,16. 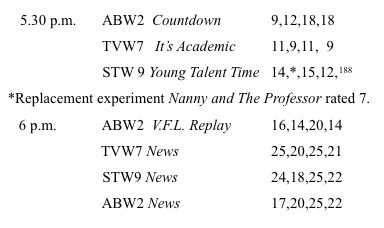 It’s Academic had been returned to its time-slot of 7 p.m. and with 31,25,21,19 was close to the ABW2 News figures of 17,23,21,19. On one Thursday the latter program, following Test Cricket rated 36 ,31 and the following night This Day Tonight enjoyed similar figures of 31 and 36. The biggest change since the start of television transmissions in 1956 was the 1972 announcement by the Federal Government that colour TV would commence in 1975. Jones and Bednall commented that ‘In 1974 there was a development that seemed destined to make all of the former content of television obsolete at a stroke. That was the coming of colour.’ The essence of this cannot be overstated. In 1990, Tom O’Regan described the introduction of colour television as ‘…a clear technical marker…’ of ‘… the third phase…’ of Australian television. O’Regan stated that ‘Colour television provided a new burst of interest in the medium. A second marker of this third phase was a great leap forward of the social, cultural and industrial importance of local product.’ It was also said that ‘This change (to colour] was in its own way as profound a change as the coming of sound to the movies in the late 1920s’ Without doubt these observations are correct and the change to colour provided a clear sign-post which still can be read. It says, Australia Went That A’Way! Australian viewers in 1974 were quite enthralled with the impending novelty of colour television When the change took place, surveys showed that people with colour sets watched more television than those with monochrome. By the late 1970s there were few homes in Australia without colour television. If I were asked my opinion today I would be inclined to say that we will have colour TV before the Sydney Opera House is completed. Martin Koffel’s paper “The Impact of Colour Television in Australia”, sets out forcefully the reasons why the Government are not likely to hold back the introduction of this exciting development very far into 1972, a year in which the Opera House is not likely to be in operation. Colour TV in the US commenced in 1953. ‘It had a slow and painful start, taking 10 years to achieve 3% of home saturation’ After 4 years it had risen to 30%. In Australia it was decided to adopt the Phase Alternating Line system (PAL) and the McMahon Government had promised an eighteen months’ notice of a starting date. This timing was expected to coincide with an anticipated upswing in the economy in 1971/72. Koffel was optimistic about the introduction of colour television but noted, ‘On the other hand, poor colour or poor programmes, unreliable receivers, lack of skilled servicemen or uninterested retailers could keep demand depressed.’ His association with the medium was made clear in the statement, ‘Obviously we in the advertising agency business are vitally interested in the health of the medium but the most direct effect colour television will have on us will be on our creative talent – the writers and producers who make the television commercials. The availability of colour would open up new areas in the field of advertising and considerable changes would be observed in forms of packaging and the choice of their colours. They would of necessity have to be compatible with public acceptance and changes would have to be made to the presentation of many items already advertised on monochrome television. Koffel concluded his report with, ‘Speaking subjectively, I believe that most of us want colour television and given a firm date by the Government, we could all work to a concrete goal for providing a first class, well-rounded, technically expert colour service months after the announcement. It was correctly prophesied that the introduction of colour television would increase the profitability of stations brought about by larger audiences, leading to an upturn in advertising revenue. On 15 February 1972 the Federal Government announced a starting date for colour television in Australia of 1 March 1975 and TVW7 ordered a complete colour Outside Broadcast Van. In the Eighteenth Directors’ Report TVW7 1976 the Company limited photographs to just one, when its only ‘star’ depiction was a full-page colour picture of Fat Cat. Local ‘live’ production was losing its ‘face’! With The Entertainment Centre still having been a financial problem, the Group’s net profit was down $51,671 on the year before at $1,155,613. The dividend was set at 11%. TVW Limited shares were quoted at $1.73. The Bank of NSW was at $6.08 and the National Bank was $2.90. A Telecom Loan was offering 10.6% interest for a 15 year term; Perth Building Society was paying 10% on pass-book savings; Statewide Building Society 11% and Australian Guarantee Corp., 12% for 4 years. It was recorded that the Entertainment Centre had been sold to the State Government but TVW7 had retained the operating rights for five years. There was a further homily directed at inflation. which does not enable sufficient funds to be retained through depreciation charges to adequately provide for the replacement of plant and other assets used for business purposes. This was fair comment for the times in regard to the relatively small proportion of the community with shares in industry. It must be recognised that in general, ‘ordinary’ people were better off than they had been previously. I was fortunate in early 1972 to open a Theatre Restaurant based on a low-cost/high-turnover formula. Most of the customers were experiencing their first taste of a dinner-dance situation at affordable cost. The greatest asset that I possessed was the fact that I was well known from television appearances. Previously, ‘night clubs’ had been pretty much the domain of the more affluent members of society. The Labor Government not only brought a bigger share of the nation’s wealth to the workers, but it gave them the confidence to go out and spend it. This major change in the perception by the working people of Australia as to their ‘place’ in the overall structure of the nation persisted after the removal of the Whitlam Government and remains the same today. TVW Enterprises sold its interests in the Lion Parks. The expectations for sales of colour TV sets had exceeded the most optimistic estimates with about 35% of Perth homes now so equipped. With two other Perth Radio Station following the 6IX lead in ‘middle-of-the-road’ music formats, the competition was much stronger. 6MD was sold to a syndicate of Merredin businessmen. Executive Management at TVW7 had decided that their business was indeed local broadcasting and where they could do so fairly easily, they divested their interests in peripheral businesses. It had nothing to do with the arrival of colour, but the basic reason was to provide a retention of cash funds above the effects of depreciation. The Thirteenth Annual Directors’ Report STW9 Limited 1976 reported that a number of news-type documentaries were produced including “Darwin City in Limbo”, and “Earthquake- the Italian Tragedy” which involved travel by a News team to both places. Also there were “Outside the Walls”, “Jawsmania”, “Supernatural Influence” and “Avon Descent” and a series of historical productions regarding this State. Photographic contributions were ‘Program Team selecting programs’, ‘Entrance- Television and Radio Studios.’, ‘Channel 9 News Desk with Peter Barlow.’, ‘Mini O.B. Unit – a recent acquisition’, ‘Anxious moment – Avon descent’, ‘Jenny Clemesha – a last minute touch’ and ‘Ampex A.C.R. 25 Video Cassette machine’. Station was transmitting 100 hours per week and the News coverage had been increased through greater use of satellite and broadband facilities. The fourth survey brought no surprises. STW9 maintained its challenge with eight of the Top Twenty including a new panel show from Sydney called Celebrity Squares. Hosted by Graham Kennedy it immediately went to No.7 with 166,00 viewers. In the next survey it had dropped to No.12 with 146,000 viewers. In the 6th Survey TVW7 News regained supremacy and commanded No.5 with a Monday audience of 196,000. The big surprise of the round was the success of the British comedy on ABW2 George and Mildred. Apart from News there was no local ‘live’ production in the Top Twenty. Emulating the famous Beatles’ White Album, the cover of the Nineteenth Directors’ Report TVW7 1977 was unadorned but the inside revealed many small shots depicting various local productions, ‘The world’s biggest tent pitched on Perth’s Esplanade to house the 1977 Western Australia Week.’, ‘The inaugural meeting (of the board) of the Telethon Foundation’, ‘Breathing fire, a dragon delights children during the annual Christmas Pageant through central city streets.’ and ‘The road to international success began here for our Miss West Coast winner Karen Pini’. [Jeff Newman pictured supporting two of the bikini-clad girls was not named.] There was a acknowledgement of local production in the claim that TVW7 had increased its local programming significantly and the long running children’s’ program What In The World won the award for the best such program on Australian television. It was a general interest half hour which looked mainly at the natural world and its effect on the lives of juveniles. The format was extended in the 1980’s by the Sydney based Simon Townsend’s Wonderworld. Other local productions included Hey! Jude a teenage program hosted by newcomer Judy Thompson, It’s Academic, children’s participation program Zippadeedoodah and holiday mornings’ Earlybirds Show. The locally produced Family Feud hosted by Tony Barber had been produced in the Eastern States but ‘canned’ due to poor ratings. Max Bostock of TVW7 picked up the rights to relocate the production to Perth and after two years it was being shown in three States. It was so successful that TVW7 on-sold the production to the Grundy Organisation and it shifted back ‘East’ to give the program a more ‘national’ feel. As well as receiving a cash settlement, TVW7 had a no-cost arrangement to retain showing rights in Perth and Adelaide. The circumstances reflected the production capabilities of TVW7 in a good light. The increase in activities had necessitated an expansion program and $3.7 million dollars was to be spent on capital works. Since 1970 the Company had invested more than $500,000 in Australian movie-making ventures. The participation in The Young Film Makers’ Awards and Young Artists Awards continued with prizes to the value of $2,000. TVW7 conducted the final of Youth Speaks for Australia national debating competition. Earlier perceptions of cut-backs had not eventuated and the future of local ‘live’ production looked good. TVW Limited changed its corporate name to TVW Enterprises Ltd. It was the idea of James Cruthers and although they were cutting back involvement in some non-related to TV areas, he thought that it better expressed the standing of the Company. The Annual Report said that ‘The introduction of color television in March 1975 sparked a recovery in commercial television revenues around Australia…’ An understatement as net profit jumped from $1,374,000 to $2,482,000 and the shareholders received a dividend of 24%. TVW shares were up 36cents to $2.09. Investments in other areas showed that Lensworth Finance was offering 12.5% for 4 years; Home Building Society 10.5% for 12 months; Bank of NSW 9% for term deposits of six months; Lombard 12.75 for 3 years and General Credits 12% for the same term. TVW7 purchased the remaining 66% of City Theatres Group on 2 June 1977 and also what was purported to be the biggest tent in the world to be used as a venue for huge stage spectaculars in the Eastern States, as unlike Perth with The Entertainment Centre ‘…the Eastern States are devoid of venues suitable for such…’ There was room for some self congratulation. Channel 7, with its policy of public service and community involvement, is a clear leader in Perth television and support from viewers and advertisers continues to be strong. The most recent audience survey (at the time of the printing of this report) shows that TVW7 had almost 50% of the total audience, with the other two stations [STW9 and ABW2] sharing the remaining 50%. In the Fourteenth Annual Directors’ Report STW9 Limited 1977 production, revenue, and ratings results were all considered successful. 650 hours of local product was created including 180 hours of children’s Zoom and Magicat. A woman’s program entitled Open House went to air ‘live’ one hour each day. The Station boasted three different production units in John Izzard’s Film Unit One, Guy Baskin’s Special Program Unit and Terry Willessee’s Unit. Some of the shows produced were The Land We Love, Speck in The Sky, Deepwater, The Great Air Race, Karen Pini – loser or winner, The West Exposed, Conflict, Supernatural Influence, Irongloves, and Twenty Five Steps. They were also producing the first of a mini-series entitled The Newman Shame with former TVW7 Women’s Presenter Joan Bruce. An EDM-1 electronic computer editing system, the first in Australia, was installed for producing high-quality commercials with special effects. Despite the foregoing, Station ‘personalities’ appeared to be on the ‘outer’ this year with the frontispiece portraying the STW9 Board of Directors seated at a large oval table. Other scattered photographs were ‘Joan Bruce and Robert Bruning on location during production of “The Newman Shame” ’, ‘A break from shooting of ‘A Land Looking West’ for Peter Cushing and Film Unit One Producer/Writer John Izzard.’, ‘The EDM-1 Electronic Computer Editing machine in action.’, and ‘6KY Master Control.’ Although there had been an upsurge in production, this year the machines were now the ‘stars’. STW9 followed in their main opposition’s footsteps when they reported a net profit $706,000, up 42% from last year. Initially the profit was reported as $747,000 but the Federal Government increased company tax to 46%. The dividend was declared at 16%. Swan Television shares were at $1.65cents. Total company sales from all operations realised $10,442,000 an increase of 48%. The Company decided to do some serious editorializing in regard to self-regulation and the effect of television on children. 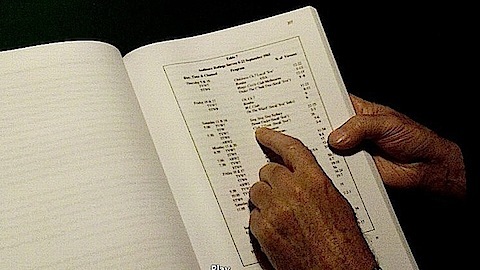 The Annual Report spelled out how Company representatives had gone to the March Perth Hearings of an inquiry into the Australian Broadcasting System, This followed the ‘Green Report’ of September 1976 that was set up by the Prime Minister Malcolm Fraser through the Post and Telecommunications Department. The main topic was the concept of self-regulation by the television stations. STW9 spoke to three points being (1) Program Standards, (2) Public access in each State to a body to listen to complaints and views and (3) The need for a special body to oversee the problems with children’s programs, a Children’s Program Committee as recommended by the Australian Broadcasting Tribunal. Your Directors believe there must always be very clear and precise standards, covering general program standards, family programs, programs for children, religious matters, political broadcasts, Australian content and advertising content. We have stated these views strongly at the three enquiries and in our written submissions. It was reported that a large number of witnesses in every State gave evidence at these inquiries and demonstrated the growing awareness and concern of the public for the future of television and radio broadcasting. Social changes in all areas meant greatly increased responsibilities and accountability of licensees which in the view of the STW9 Board ‘…was a forward step.’ With the advances made in the fields of electronic news gathering, satellite news services and all technical areas necessitating such action, STW9 instituted a scheme to train apprentices in the commercial television, production and broadcasting fields. The first six [all men] had already been selected. 1977 Ratings showed that a new local ‘live’ production featuring STW9 News-reader Peter Barlowe, Travel failed in its 1.45 p.m. spot with ratings of 2,2,2,2, against the Soap Opera Another World on TVW7 with 18,16,16,16. The Sydney based noon program The Mike Walsh Show was being shown on TVW7 with ratings of 11,11,9,9, against STW9’s movies with 10,8,6,8. The American sit-com Happy Days reflecting the 1950’s was very successful in its first ratings period with 31,33,37,35 on Tuesday evenings at 7.30 p.m. 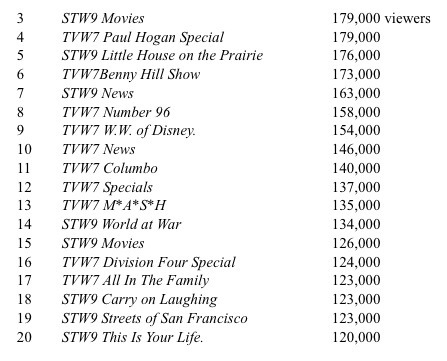 The survey TV6 of 1976 showed that while TVW7 had the first six positions, STW9 had half of the Top Twenty at Nos. 7,8,9,13,and 15 through 20. 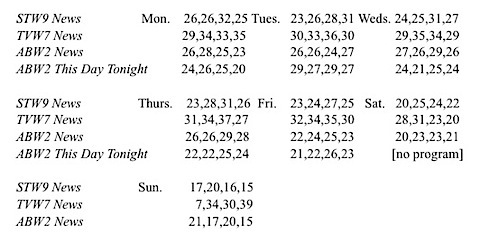 By April-May 1977 Happy Days was on top with 257,000 viewers. Sunday afternoon figures were interesting, The TVW7 locally produced It’s Academic was certainly no longer a dominant force and in fact had succumbed to the Melbourne produced program, compered by former TVW7 teenage personality Johnny Young. Survey 3 of 1977 produced the long awaited triumph for STW9 over TVW7 in the News area. For the first time STW9 won the ratings for every night [bar one] of each week, including one night up against the test cricket on ABW2. The 1966 movie The Fall of the Roman Empire rated 33,31, Happy Days and M*A*S*H were still Nos. 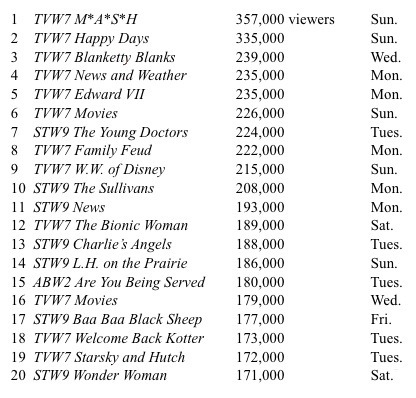 1 and 2 while new show TVW7’s Welcome Back Kotter was at No.6 with 196,000 viewers. TVW7 had introduced Hawaii Five 0, which was No.11 with 175,000 viewers. A Current Affair was doing an ‘in-off’ the News with an audience of 158,000 at No.16. ABW2 got onto the charts at No.19 with former TVW7 Naturalist Harry Butler’s Call of the Wild with 142,000 viewers. TVW7 had No.20 with 141,000 viewers of Here’s Lucy. TV4 Survey showed that Happy Days was the highest rating show ever and its audience had jumped to 325,000. STW9 News was at No.11 with 180,000 and ABW2 had one Monday evening News which surprisingly returned a figure of 146,000 at No.20. 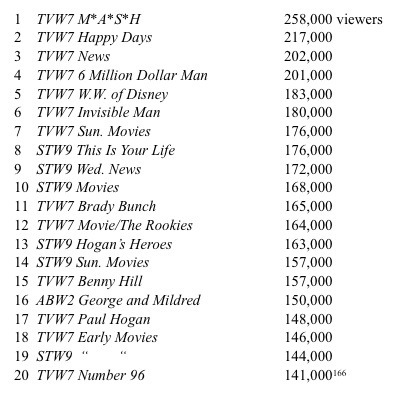 ABW2 also had the No.18 spot with In The Wild and Test Cricket attracting 155,000 viewers. 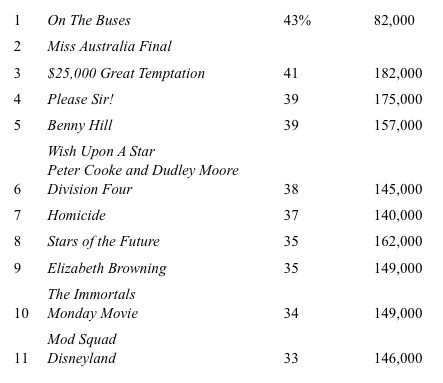 The final survey for 1977 held produced these results with Telethon still attracting a big audience. TVW7 introduced a new current affairs program at 6 p.m. produced and presented by former Western Australian journalist Mike Willessee. Its first outing scored 21,25,24,27. TVW7 was locally producing a new game show Family Feud with host Tony Barber attracting a very good following with four week ratings in the 7 p.m. spot of 32,33,40,36. At 5.30 p.m. on TVW7 repeats of Lost in Space 24,27,22,23 were beating STW9’s Get Smart with 8,13,11,15. This was probably an anomaly, but it belied the belief that the previous program always acted as the stepping stone to the next as STW9 News followed with 34,32,34,29 against TVW7 News with 32,37,34,32. A Tuesday night audience passed up the opportunity to watch the crowning of Miss Western Australia on TVW7 which rated only 23, in favour of the movie Spartacus on STW9 with 30. ABW2 had the Sydney produced period drama Rush with a rating of 10.On TVW7 the annual Telethon at 8.15 p.m. on Saturday night rated 48 against a movie on STW9 at 27. According to the Twentieth Directors’ Report TVW7 1978 the biggest local ‘live’ television event of 1978 was the staging of Bob Hope Down Under at the Perth Entertainment Centre, ‘recognised by the Guiness Book of Records as the largest proscenium theatre on earth…’ The show was jointly produced by NBC-TVW and shown to an estimated North American audience of 80 million, providing them with a ‘…never to be forgotten performance…[in which] our customs became the target for the inimitable style of the King of Comedy.’ Long time TVW7 Floor Manager Jeff Thomas has insightful memories of the occasion. American Producer Chris Bearde said, ‘ “Australian technical facilities and crews, particularly those of TVW7 in Perth, are world class and could produce quality variety shows for global distribution” ’ There was a large photograph covering both front and back of the Report, that showed Bob Hope on stage with Florence Henderson, Barbara Eden [I Dream of Jeannie], Charo [the ‘outrageous’ singing wife of Latin-American band-leader Jose Iturbi], Kamahl and The Four Kinsmen. The program was an excellent advertisement for Western Australia in general and included film coverage of our habitat and lifestyle. Another full-page photograph of Fat Cat with M*A*S*H star Loretta Swit, a night picture of the Entertainment Centre, ‘inside action in one of four Radio 6IX studios.’ And ‘The recently acquired Rank Cintel telecine chain has greatly enhanced the quality of on-air transmission.’ Film was still being used, whereas today everything is stored on tapes or discs. TVW7 also staged the Australian Beauty Pageant which was touted as a dress rehearsal for the big event of the Western Australian 150th Anniversary Celebrations, Miss Universe 1979 to be seen by ‘…more than 700 million people in 50 countries.’ It was the hey-day of television production and TVW7 listed their output as Fat Cat and Friends, A Touch of Elegance [a one hour women’s program telecast daily Monday to Friday] Junior Jury, [a national school-age children’s quota program], Earlybirds and Crackerjack [hosted local children shows with guests and cartoons], It’s Academic and covered the sports of football, soccer, netball, tennis, horse-racing, and motor cycle and motor car racing. In conjunction with the Australian Film Commission, TVW7 produced the first telefeature made in Western Australia, The Scalp Merchant which created a lot of employment in the industry and was highly rated by local TV audiences. They also entered into a production agreement with Philip Adams in regard to an animated film Grendel, Grendel, Grendel., a major documentary about Northern Australia Learn Fast or Die Young by Richard Oxenburgh was also produced. TVW7 was also offering assistance to the newly formed Western Australian Film Council. Production of historical features to be aired during 1979 was under way. Local production was indeed ‘live’ and ‘well’! The back-cover bore the photographs of the Birdman Rally, ‘South Australian Premier Don Dunstan who is no stranger to the footlights, “hams-it-up” with veteran Keith Michell in an SAS10 television production from Adelaide’, ‘Channel 7 personality, Tony Barber, hosts the popular “Family Feud” National Quiz program. This is produced in TVW’s Perth studios.’, ‘During 1978, Channel 7 introduced to Perth viewers the top rating English series Edward VII, which featured Timothy West in the title role’, ‘Telethon 1977 host, Jeff Newman, introduces Susan Seaforth-Jones and Bill Hayes, stars of “Days of Our Lives”, at the star studded non-stop, 24 hour telecast. Australian and local artists assisted in creating a record Telethon fund raising total.’, and ‘International character actor, Cameron Mitchell, in a scene from “The Scalp Merchant” a TVW telemovie which was shot on location in Western Australia’s timber country and Stirling Ranges’. In terms of promotion of Western Australia both nationally and overseas, these developments had special significance for the future of tourism and provided a window to the rest of the world. Dividend increases have more than matched the rate of inflation over the past few years, with inflation averaging 11.7% a year, and annual dividend increases averaging 18.3% compound. It is perhaps worth noting that the company’s total dividend payout has more than doubled in five years. years; Lombard 11% at call and G.M.A.C. 9.25% for 3 months. Australian overseas exchange rates were $A equalled $US1.58 and .58 of an British pound. The Fifteenth Annual Directors’ Report STW9 Limited 1978 recorded that during the year an excellent new facility in the form of a studio, separate from the main building was completed and local ‘live’ production was still ‘full-steam-ahead’ at STW9 with the News team producing special programs on Middle East – The Last Thread, and Bali – The Shame of it All. An arrangement was concluded with South Western Telecasters to carry the STW News by relay to BTW3 Bunbury, GSW9 Mount Barker, BTW6 Narrogin, GSW110 Albany, BTW6 Katanning and BTW11 Wagin. Film Unit One produced a series on the flora and fauna of Western Australia and Koala- A Vanishing Australian The Special Programs Unit produced records of historical events and Death Cell, UFO’s Are Here and The Mitchell Plateau. The Willessee Unit produced a documentary on the local drug scene, First You Get The Habit, a program on different life-styles, The Alternatives and Models and Mannequins. Peter and The Wolf was produced as ‘…a pictorial description of a symphony orchestra with a fairy-tale story line…an excellent long playing record was made.’ The pursuit of sporting events was carried out with the O.B. Van and coverage included cricket, golf, football, racing, equestrian, boxing, basketball and squash. A team also went to the America’s Cup in Newport and produced a program called Newport’s Under Sail. A Coverage of the World Powerlifting Championships in Perth was produced for N.B.C. of America. A wonderful future for the ‘…skills and expertise by an enthusiastic staff.’ was predicted although a prophetic rider was added, ‘We emphasis however, that the level of local production will be directly proportional to the prevailing economic conditions of our industry.’ The Federal Government had accepted the recommendations of the Australian Broadcasting Tribunal with regard to Australian Content, Children’s Television programs and Advertising Content and intended to set up a Broadcasting Information Office with a committee to look at the Children’s area. The report said that all of these measures were those put forward by STW9 in their submission. Pictorial records showed ‘Channel 9 Media Exhibition’, ‘Terry Willessee receiving “TV Week” Logie’, ‘STW9’s new studio’, and ‘ “Helping Hand” – a continuing community project. As well there were photographs of a televised golf event, Sir Charles Court with L.J. Kiernan, Appealathon and the Champion Footballer Awards. Reflecting the changing trend in who was of most importance to the station, one whole page of photographs was devoted to senior staff, fifteen in all but including only three ‘personalities’. Finally there were promotional shots of The Sullivans and Young Doctors. Operating profit for the year increased by 21% to $855,459 after providing $921,654 for depreciation and increased cost of asset replacement, and $627,511 for income [company] tax. The dividend was declared at 24%. Despite this, it was noted that ‘…the trading results were not really satisfactory.’ Swan Television shares were trading at $1.80. It was stated that the STW9 overall survey ratings showed them to be 38.2 which equates to 44.6% (commercial audience) and 36.3 being 44.4% at night. The viewing area was reckoned to have 270,000 TV homes with 893,000 people. Colour sets had been purchased for 74% of these dwellings and 22% had more than one set. Growth of television revenue had fallen to 17% as compared with the colour-driven 54% in the previous period. 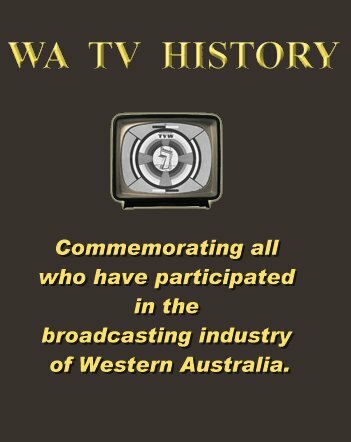 It was also said that in regard to the 150th Anniversary Celebration ‘Swan [Television] will be seen and known to be exercising its responsibility to the State as an independent Western Australian public company’ A public enquiry to examine the feasibility of licences for the Eastern Wheatbelt was forecast and another inquiry was held regarding the establishment of Public Broadcasting Licenses for ethnic and special interest groups. STW9 was in favour and offered to provide facilities. Following speculation that there might be another commercial television issued for Perth, the Company decried this on the grounds that it would harm profit levels to the extent that their Local Production would suffer and STW9 would then be unable to ‘…discharge their social responsibilities to the community.’ Both of these prophecies would eventually prove to be correct. The responsibility for transmitted material must always remain with the local licensee. The practice of training six young men each year for the industry was continuing. Although STW9 out-rated TVW7 in the News with 191,000 viewers on a Wednesday evening to 187,000 viewers on a Monday, the former had only seven of the Top Twenty in the April-May 1978 survey. On Sundays TVW7 replayed local football from 11 a.m. to 1.30 p.m. for 13,15,10,12 against the same material on ABW2 which yielded 3,4,2,2. TVW7 did a live coverage of the Anzac Day March improving their other Monday morning figures of 4,2,4 to 12 thereby. The local live production of Today with Stephanie Quinlan returned the poor figures of 3,3,2,3. One month later TVW7 had regained their News crown and held No.5 position on the Top Twenty with a Monday audience of 227,000. STW9 had slipped to position No.12 with 175,000 viewers. TVW7 maintained their lead throughout the rest of 1978 and in the final survey their News was No.3 with 225,000 whilst STW9 was down to No.14 with 180,000 viewers. Within six months there had been a reversal once again and STW9 News on Monday had the best returns at No.3 with 271,000 viewers while TVW7 News had slipped to No.9 with 214,000 on Tuesday night. However, on Sundays, TVW7 was dominant over three weeks with 30,33,29,23 against STW9’s 22,21,27,28. In the current affairs department the newly introduced Terry Willessee’s Perth was an immediate success at No.8 with 218,000 audience. The final survey of 1978 showed good results for TVW7. Telethon with 233,000 viewers was third behind M*A*S*H and Happy Days. At No.15 the A.B.C. had struck a blow with another British comedy, Are You Being Served. In the Twenty First Directors’ Report TVW7 1979 the main focus of the year was on the production Miss Universe. It was relayed to 46 countries. The directors believed, ‘…the success of the event was a credit to all those involved’. This was excepting the carpenters who constructed the stage at the Entertainment Centre. Seconds after going ‘off-air’ an invasion of photographers over-loaded the structure which collapsed. Luckily nobody was seriously injured but it took the shine off the event. The Annual Report did not mention this. The front cover of this Report was a beautiful photograph of Miss Venezuela, Maritza Sayalero, after she was crowned Miss Universe 1979, on a TVW produced telecast estimated to have been seen by 600 million viewers world-wide. The 1979 Report was an expensive looking product but thoroughly justified by the Group’s net profit for the year of $3,939,000. Along with its Financial Highlights, the first page was devoted to The Objectives of the Company. Entertainment, communication and information are the pillars on which the company has been built. Its activities include television, radio, cinema exhibition, theatrical entrepreneuring, live theatre management, and other activities associated with entertainment and information. Broadly, the company’s objectives are to provide television, radio, live entertainment, and associated services for as wide an Australian audience as possible. The company also aims to involve itself with its community and provide services aimed at improving their enjoyment and life-style. For this reason the company assists numerous charitable organisations, conducts appeals for medical research, provides awards for young people in many spheres, and assists in numerous community endeavours. Other objectives are to keep abreast of changes in social structures and technology to ensure the financial viability and strength of the company for the benefit of the shareholders. The company also continues to look for opportunities to extend its activities in compatible fields. One of the more noteworthy occurrences at this time was the termination of the joint-buying program which had been in effect between the two commercial stations since 1965. This was instigated by STW9, the other partner in Television Facilities (WA). TVW7 deplored the move, saying that it would increase the cost of programming which would have to be off-set by a reduction in local programming and the money previously saved by the buying cartel would go to the Eastern States suppliers. Of course, their other problem was that STW9 would now be able to form an affiliation with the Nine Network and consequently would be able to ‘poach’ the good rating programs that would be available. NEWS has long been considered the flagship of any T.V. Station and in this regard we are particularly well served by a very efficient, professional and dedicated staff. On a daily average basis 225,000 viewers watch the Channel 9 News at 6 o’clock, whereas less that 200,000 watch any other news service. This has recently been supported by the current affairs program – Terry Willessee’s Perth. This program achieved remarkable success with an average nightly viewing audience of 218,000 and has continued to do so. The Channel 9 News and Terry Willessee’s Perth are two Western Australian originated programs. These two programs are shown throughout the area covered by The Golden West Network to a potential audience of 185,000. Operating profit increased by 26.8% to $1,168,536 and the annual dividend was 16%. Costs increased by 21.4%. It was noted that 94% of shareholders resided in Western Australia, about 5% in the rest of Australia and less than 1% overseas. On the Stock Market Swan Television shares were selling at $1.80. The claim was made that in the area of ‘quality and range of equipment’ STW9 was a ‘clear leader’ Additional land was being purchased adjacent to the Dianella studio complex. [The address had changed from Tuart Hill.] As if in answer to their rival’s claims, rating figures were given. Our OVERALL rating (6am to 12mn) was 39.3 %(33.9%) [previously] giving a commercial viewing share of 45.6%, while the night rating (6pm to 12mn) was 41.7% (34.1%) giving a commercial viewing audience share of 49.6% (43%) A further breakdown of the important night viewing audience share reveals a rating of 40.4% (32.6%) during 6pm to 9pm with a commercial viewing audience share of 50.2% (42.7%)and during 6pm to 7pm a rating of 47.9% achieving a commercial viewing audience share of 55.3% (45.1%). Statistics are wonderful things, no less than their possible interpretations. By the second survey of 1979, TVW7 had regained their News crown and held No.5 position on the Top Twenty with a Monday audience of 227,000. STW9 had slipped to No.12 with 175,000. 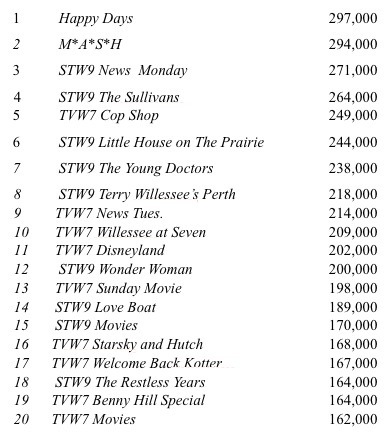 The Sullivans, a new Australian drama series from Crawford Productions in Melbourne produced a good result for STW9 coming into No.13 with 174,000 viewers. Charlie’s Angels was new on TVW7 with 166,000, while American import Wonder Woman rated No.18 with 164,000 on STW9 on Saturday nights. 9 July-5 August showed that TVW7 had the top six programs in the Top Twenty and STW9 only seven of the remainder. 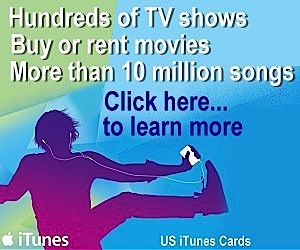 STW9 News was at No.14 with 180,000. The big program of this survey was the introduction and immediate success of STW9’s Terry Willessee’s Perth. At 6.30 on Monday evening it produced 38,33,39. His brother Mike’s program from Sydney on the same nights at 7 p.m. had 36,32,31. The Willessees were current affairs ‘Kings’! On Sundays STW9’s VFL Football was rating 7,5,6,6 to TVW7’s Racing with 2,6,3,4. The Flintstones on TVW7 with 13,13,13,12 compared to Young Talent Time with 14,13,20,12 and STW9 News with 22,21,27,28 compared to TVW7 News with 30,33,29,23. ABW2 at the same time showed VFL Winners for 19,13,14,17. Although a strong audience draw Disneyland with 26,26,27,24 had succumbed to Little House on The Prairie with 33,28,33,34. 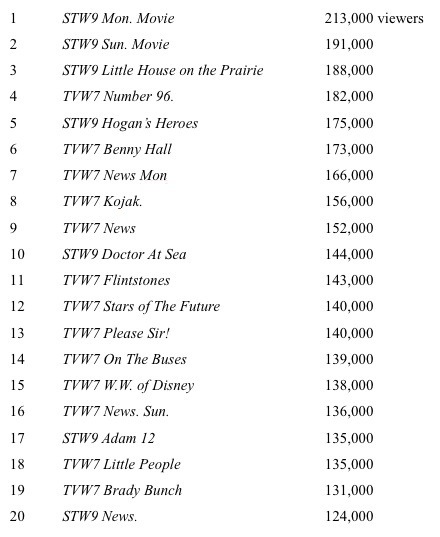 TV5 1979 showed the Top Twenty as TVW7 and STW9 as having eleven and nine respectively and the same for TV6. Although Willessee at Seven was still No.9 with 206,000, Terry Willessee’s Perth had slipped to No.16 with 167,000 viewers. Telethon once again rated highly at equal fifth with 243,000, the Muppets on TVW7 was No.11 with 204,000 and their new Rich Man Poor Man was No.19 with 158,000. At 9.30 a.m. Here’s Humphrey on TVW7 was doing 5,5,4 against Flapper [a new local ‘elephant’ costume character] on STW9 with 1,1,2. According to the Twenty-Second Directors’ Report TVW7 1980 this was a very good year for local ‘live’ production. In 1980 TVW7 introduced the first of its helicopters to Perth, equipped with portable electronic camera/recorders and the ability to transmit local ‘live’ to the studios. The front and back covers pictured this machine hovering over the city. On the inside was a scene from the 1980 Australian Beauty Pageant. Two more full-page photos followed, one being a scene from the stage musical Evita and the other the wreck of the ‘Anitra’ which ran aground at Rottnest during the Parmelia Yacht Race. The TVW7 helicopter was once again in evidence. There was a photograph of Sir James Cruthers, recently named in the Queen’s Birthday Honours in recognition of ‘…his services to television, the arts and the community’. Advertising revenue increased by 6% and the building extensions were completed at the studios. A new children’s program The Underground Video Show was produced in line with ‘C classification requirements’, Fat Cat’s Funtime Show was shown on Saturday mornings and Stars of the Future was resurrected. Another ‘old-timer’ saw the light of day in Letterbox with Eastern States, current affairs ‘funny-man’ Paul Makin as the compere. Televised events included Miss Universe Pageant, Parmelia Yacht Race, Anniversary Year Closing Concert, 1979 Anniversary Air Pageant, and the Miss Australia Quest. It was recorded that TVW7 was co-producing Cop Shop and Skyways [not in Western Australia] with the 7 Network and Punishment with the 10 Network. The date for the introduction of the domestic communications satellite had been nominated as 1984. There was bad news for local production with the statement that economic strictures would result in the majority of expenditure being henceforth directed to that purpose. The TVW7 net operating profit for the year 1980 had increased 8.1% to $4,600,000 and a dividend of 30%. TVW shares could be purchased at $3.30, so buyers at that time were looking at about a 5% return on their money. Of course those who bought the original shares were still ‘laughing all the way to the bank’. Comparative returns investments were Perth Building Society 11.5% for 12 months; Rural & Industries Bank 9% at call; Home Building Society 10% for 30 days, ditto Bonds 13% for 3 years; Perpetual Trustees 10% at call or 13% for 3 years. Share prices included ANZ Bank $4.50; Bank of NSW $3.05; National Bank $2.70 and Bell Group were on the rise at $4.50. The returns for 1980 had interceded to thwart the dire predictions of just a few years earlier. This was because of the introduction of colour, which was now in 80% of homes. It was noted that the revenue increases were starting to level out. First mention was made of the prospective advent of cable and pay television which along with satellite systems would bring new challenges. There followed a full-page photograph of the new Cinema City. In the Seventeenth Annual Directors’ Report STW9 Limited 1980: a photograph of a beaming Board of Directors introduced the happy news that company profits had increased 24.3% to $1,348,000 returning a dividend of 17.7%. The Company shares were almost equal to those of TVW Enterprises Limited at $3.15.As a large of majority shares were controlled by the six men pictured, they had every reason to look happy. Advertising sales were up by 24.8% and the local market grew by 13.5% as compared to 19.6% in the previous term. This was good news for local ‘live’ production. Clapperboard, a film review program was continued, as was The Squirrels Club (sponsored by the Perth Building Society). A local talent quest The Entertainers was also being produced on a weekly basis and STW9 contributed financially and with facility use to the Perth Institute of Film and Television’s production of Falcon Island. However, the swing to accepting the inevitable incursion of out-of-State programs was evident in the promotion of ‘…The Sullivans, The Young Doctors, The Prisoner, The Mike Walsh Show, The Don Lane Show, Young Talent Time, and Simon Townsend’s Wonder World. World Series Cricketand night cricket, along with Wimbledon tennis and golf proved popular. Pictorial promotion in this report was a mixture of local ‘live’ promotion and the other facets of the company’s business. Russell Goodrick, Bruce Walker and Barrie Barkla on the News and Weather set; Terry Willessee talking to Prime Minister Malcolm Fraser; Radio 6KY’s Vern Stone (General Manager), Graham Lorrigan (Sales Manager), Ern Street (Marketing Manager), Alan Aitken (Music Director) Warren Gillespie Operations Manager); Swanline Hauliers’ Michael Kiernan (General Manager), Ken Walker (North West Manager) and Terry Kelly (Transport Supervisor); The Entertainers set; Elephant Productions Company, Flapper and Lynne Crozier with Chris Woodlands on Flapper’s Super Heroes. A page of publicity shots showed various aspects of the 150th Anniversary Celebrations; the same for the imported productions listed above; a page of sporting photographs; Tony Barrett, the Commercial Production Manager; two pictures from Appealathon; two 1980 FACTS (Federation of Commercial Television Stations) Awards for music and animation and two pages devoted to the executive staff, technician apprentices and graduates. With the Chief Executive of the Company having come from a trucking industry background, the establishment of Swanline Hauliers (which occurred unheralded in 1978) was acknowledged along with the information that they offered scheduled services to Karratha, Port Hedland, Mount Goldsworthy, Broome, Derby, Halls Creek, Kununnurra and Darwin. There was a flavour of nepotism about the move as one of the boss’s sons (Michael Kiernan) was appointed manager of the new division. The business was set up from scratch with the purchase of a new fleet of heavy vehicles. Laurie Kiernan could see no incongruity in the move and said that it proved to be a sound venture. This Annual Report said that Radio 6KY was proving to be a good sales platform for the Station, rating second overall and Number One with the ‘housewife category’. STW9 Programs could be promoted on radio during the day and ‘contra’ advertisements on night-time television sold the idea of listening to 6KY during the day. The new decade’s first survey showed, TVW7 News 28,21,25,25 STW9 News 19,21,12,20 (ABW2 Countdown 15,16,18,19) By April-May STW9 News was No.3 with 247,000 and TVW7 News was No.15 with 197,000, both on Monday. There was more joy in the next ratings period when STW9 News attained No.2 with 248,000 with TVW7 News at No.13 with 206,000. In the Aug-Sept. 1980 survey, the locally produced quiz game show Letterbox scored on a Monday evening 28,31,28 against the STW9 News with 37,29,36. Terry Willessee’s Perth rating on the same night 33,31,24,36 against the TVW7 News with 31,36,32,32. At 7 p.m. Willessee at Seven was rating 40,36,35,34 against the ABW2 News with 15,18,19,12. The new decade dawned brightly for STW9 with eleven programs in the Top Twenty, which TVW7 discounted by pointing out that they had seven of the first ten. In the local ‘live’ area Terry Willessee’s Perth was down to No.20 with 141,000 viewers. His brother Michael’s Sydney based program was not in the survey. At noon on Monday’s ‘live’ [by broadband and held for two hours] from Sydney, The Mike Walsh Show was rating well with 19,20,13,19 against the soap opera Days of Our Lives on TVW7 with 17,19,14,15. On the News front it was TVW7 28,21,25,25, against STW9 19,21,12,20 and the ABW2 Rock Music program Countdown on 15,16,18,19. 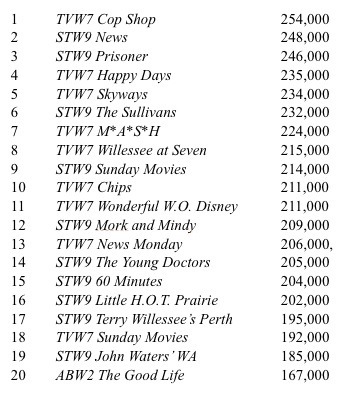 New programs were Prisoner at No.5 for STW9 with 247,000 viewers, Skyways at No.6 with 242,000 and Holocaust at No.7 with 228,000 viewers did well for TVW7. 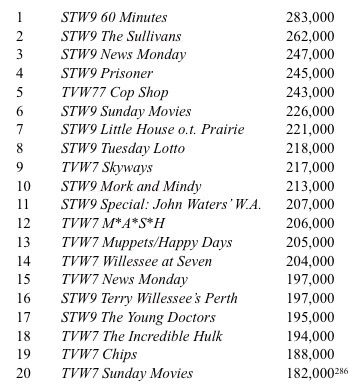 Mork and Mindy was at No.8 for STW9 with 225,000 and The Incredible Hulk was No.10 for TVW7 with 208,000 viewers. The formerly dominant Disney program had fallen to No.19 with 160,000 viewers. The best result ever for STW9 followed in April/May when they still had eleven of the Top Twenty but this time, eight of the first ten. The newly introduced 60 Minutes was huge but their Appealathon was disappointing with a best rating of 34 on Saturday night. TV3 1980 showed an equal split with both channels holding five places in each section 1-10 and 11-20. The change in fortunes between TV2 and TV4 was remarkable. 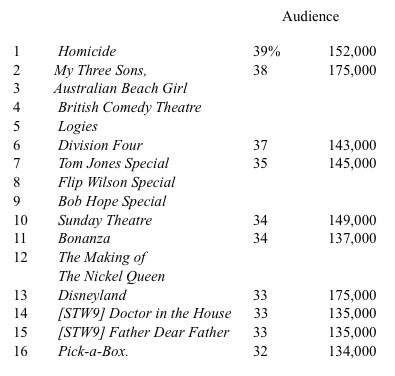 In the following survey a local ‘live’ quiz show entitled $25,000 Letterbox came in at No.16, proving that well produced shows on TVW7 were still acceptable to the viewing audience of 188,000. It scored on a Monday evening 28,31,28 against the STW9 News with 37,29,36. Terry Wllessee’s Perth rating on the same night 33,31,24,36 against TVW7 News with 31,36,32,32. At 7 p.m. Willessee At Seven was rating 40,36,35,34 against the ABW2 News with 15,18,19,12. The new program Dallas entered the race at No.20 with 166,000 viewers. This decade marked the high point for local ‘live’ production on Western Australia Commercial Television. It saw the acceptance of STW9 by the wider viewing community, with a levelling out of the ratings and a profitable period for both stations. Colour television was successfully introduced and enthusiastically adopted by the viewing public. It provided a big boost to consumer spending and showed that the Australian standard of living had risen substantially since 1956 when television was first transmitted in the Eastern States. In 1973 TVW7 staged their first Christmas Pageant and continued their policy of extensive involvement in other community activities. The Company also invested in a theatre chain and were instrumental in the building of the Entertainment Centre in Wellington Street Perth. However financial difficulties concluded with the State Government of W.A. mounting a rescue package to acquire ownership of the project. Although enjoying good relations with the Court Liberal Government, in 1975 TVW7 management was very critical of the three years performance by the Whitlam Labor Government in the Federal arena. The mid-1977 television audience ratings surveys produced the long awaited News triumph for STW9 when for the first time they won six of seven nights in one week. A follow-on from this was the cancellation (by STW9) of the joint program purchasing agreement. Western Australia received world-wide coverage in both 1978 and 1979 with a Bob Hope Special and the Miss Universe telecasts from the Entertainment Centre. Both commercial channels participated extensively in the 150th State Anniversary Celebrations. There was enough money made through advertising (and the diversification into other industries, including radio and a trucking business by STW9) to ensure that superiority was a priority in being seen as the top ‘local’ station. STW9 shares were trading on the Stock Market at an almost equal amount to those of TVW7. Although there were new regulations regarding children’s programs, the effect was minimal in Western Australia, as production of daily programs of that type had ceased. The provision by both commercial stations of financial outlay to produce ‘entertaining’ local ‘live’ was starting to lose its dimension of being part of Community Responsibility. The following Chapter Nine concludes the examination of the period 1958-1990.